Crucifixion is believed to be the worst kind of death that has ever been invented. What was it like? What did Jesus have to endure so that you and I could have eternal life? Perhaps the most cruel, vindictive, torturous death anyone at anytime in history could have ever experienced was to be crucified. There is nothing that is even remotely close to such a barbaric death penalty as crucifixion was. The Romans had stolen the idea from the ancient Persians and Alexander the Great introduced the idea to the Greek Empire but these forms of death were given only to pirates and the worst of criminals. In the Roman Empire, the crucified person would be left hanging on the cross for several hours of torture. They were crucified completely naked and well above the ground and usually on main thoroughfares and on high ground so that everyone could see the penalty for committing crimes or insurrection. It was meant to be a deterrent. At Jesus’ crucifixion, which took place on Golgotha (place of the skull), there must have been thousands who witnessed it. The chances for survival were next to impossible. The condemned criminals had to carry their cross to the place of execution. Contrary to what is depicted by artists, Jesus likely only carried the cross-arm (called the patibulum) because the upright post (called the stipes) was generally set in the ground already and was used over and over again since there was a shortage of trees in the area and the Roman‘s did not like spending a lot of time with crucifixions. Jesus carried this heavy beam, which would have been rough and splinter-laden to cause even more pain. It must have been about 7-8 feet long and around one foot wide and at least a half of a foot thick. It could have weighed around 100 pounds or more. The fact that Jesus struggled to carry it and needed help was not due to the weight but because of Jesus’ scourging by the Romans who had beaten Him to a bloody pulp. He would have lost so much blood by the time that He was carrying it that He was unable to make it the entire distance. It should be noted that Jesus’ trade required great physical strength. Jesus must have been a very strong man because carpenters in those days had to cut down their own timbers, carry them some distance and cut them to size. Considering that stone masonry was part of carpentry at that time, this also meant that He must have had to quarry and cut stones, transport them, and them lift them into place. Being a carpenter in Jerusalem was the most physically demanding trade in the Roman Empire so Jesus was obviously not the effeminate figure that He appears in so many artistic works. When we read about the nails that pierced Jesus’ hands and feet, these were not nails as we think of them. They were much like railroad spikes but much longer. They resembled what are called garden spikes and they were about ¾ inch wide and around 6 to 8 inches long. When they were driven through the hands and feet, they were hammered flat on the back side of the wooden beam so that they would keep their impaled victims in place. These nails were not driven into the hands but actually into the wrists because the wrists were considered to be part of the hand and the palms of the hands were insufficient to hold up the weight of a person. There were enough tendons to support the body weight of a man if these were driven through the wrist between the radius and ulna which is where these had to be hammered in order to hold him up on the cross. As for the feet, they drove one large nail (like a railroad spike) through the top side of the middle of the feet. These were hammered through both feet and they bent the knees of the victim. The victim would have had to push themselves up to breathe, which produced excruciating pain. The feet may have rested on a foot-rest (suppedaneum) but it is unknown if Jesus had one of these. Scourging was just part of Jesus’ punishment and was more than a severe beating. It involved whips or lashes made of leather thongs which were attached to a handle. These thongs contained metal fragments and pieces of bones that literally tore the flesh off of Jesus. After Jesus was scourged it was recorded to say, “When Jesus came out wearing the crown of thorns and the purple robe, Pilate said to them, “Here is the man” (John 19:5)! What Pilate was really saying was, “Look at this man! Isn’t this enough? He’s hardly recognizable as a human being. Look at Him!” Even with this bloody pulp of a Man, they still screamed, “Crucify Him” (John 19:6)! They also attached a crown of thorns that were likely 1 to 2 inch thorns of briar that were hard as oak and they likely penetrated not only through the skin but penetrated parts of the skull bone. This would have caused a large loss of blood and created severe hemorrhaging of the brain tissues. By the time Jesus went to the cross, He had pieces of His flesh hanging off of Him and He had large open wounds that bled profusely. He also must have been unrecognizable because Isaiah records in 52:14 that “Just as many were astonished at you, my people, so His appearance was marred more than any man And His form more than the sons of men.” What this is saying was that He didn’t even look human anymore and was so marred that no Man has ever been reduced to the pulverized piece of flesh that Jesus was. Jesus was spit upon, His beard was plucked out, His teeth were likely beaten in or broken off, and they ridiculed Him, laughed Him to scorn, mocked Him and feigned Him as “the King of the Jews” all the while putting Him to open shame. All the while, Jesus was silent, never raised His voice, never tried to resist. He took the full brunt of all the wickedness of all of humanity for all time. The religious leaders also taunted Him and said if “You who are going to destroy the temple and build it in three days, save yourself! Come down from the cross, if you are the Son of God! In the same way the chief priests, the teachers of the law and the elders mocked him! He saved others,” they said, “but he can’t save himself! He’s the King of Israel! Let him come down now from the cross, and we will believe in him.” (Matt 27:40-42)! In Jesus’ humanity, He must have thirsted like no other human being has ever thirsted. Remember that He had nearly no blood after the overnight trial and was literally dying of thirst. Then, “they offered him wine mixed with myrrh, but he did not take it” (Mark 15:23). The wine vinegar was usually given to dull the senses of the condemned criminals as some sort of pain killer to lessen the effects of the torture. Some manuscripts say it was attached to a hyssop which is an herb that grows wild in the Mediterranean region and for centuries has been considered an herbal medicine. Myrrh, which means “bitter” comes from a tree and also has medicinal properties which could dull the senses due to severe pain. 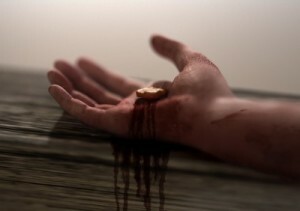 The astonishing thing is that “he did not take it” (Mark 15:23). This means that Jesus refused the offer of a pain killing mix of myrrh and wine that would have made His torture somewhat more bearable. His side was pierced with a sword to see if He was dead and water and blood poured out from His side. His internal organs were probably pulverized or like turned to wax. I believe the reason that He refused this was to take on the full brunt of all of the wrath of God for all of humanity for all time, for all of the sins that humans have committed, were committing, and will ever commit in the future (as in today, some 2,000 years later). Jesus’ paid a penalty sufficient for all of the sins for all of the humans that had been born, going back into the Old Testament, that had occurred during the New Testament period, and for today, tomorrow, and ages without end. So complete was this supreme of all sacrifices that it covered Abraham’s sins, Moses, Joshua’s, David’s, and for all those living then, for all those living today and in the last 2,000 years, and for all time without end into the eternal Kingdom of Heaven, which will be a government of God without ending because of “the increase of his government and peace there will be no end“ (Isaiah 9:7a). How many of your sins and how many of my sins were ahead of Jesus’ sacrifice when He died and paid the price for them all? All of them! As it is written, “But when this priest [Jesus] had offered for all time one sacrifice for sins, he sat down at the right hand of God” (Heb 10:12). Jesus died the most horrendous death ever contrived by human beings in all of history but the grave couldn’t hold Jesus. Why? It is because Jesus had never sinned and so no grave could hold a sinless God-Man. Since the wages of sin is death (Rom 6:23) death could not keep Jesus in His grave because He was sinless. It is a historical fact that “God raised him from the dead, freeing him from the agony of death, because it was impossible for death to keep its hold on him” (Acts 2:24). This long agonizing day was after an all night vigil without sleep, an illegal trial by night, false witnesses testifying against Jesus, Pilate declaring His innocence, his scourging, and hanging on the cross from 9 A.M. until His death at 3 P.M. I do not believe it is coincidental that at the same time of Jesus’ death, the Passover sacrifice was made. He hung on that cross for some 6 hours in utter agony after being tortured all night. This shows just how much God loved us. To send His own Son to die such a horrific death is just too much to try and describe. Since He died for you, why not place your trust in Him today and then you will never die but have eternal life in Christ Jesus our Lord and Savior. If not, you will face Him as your Judge on that Day (Rev 20). Looking for more about Jesus and the cross? Another great article Jack. You truly are a wise man. and It is clear that God is working through you and your writings. Thank you so much Michael. You truly live up to your name which means I believe (in Hebrew) “who resembles or who is like God?”. I do hope God is using me but the glory goes to Him, 110% my friend. God bless you my Barnabas encourager. This was an excellent representation of Christ’s crucifixion. Your wealth of knowledge has imparted many facts that I had not known about Jesus or his horrendous crucifixion. This makes me love Jesus that much more. He is truly our Savior and Redeemer! God bless you brother. Thanks Derek. When I consider all that He did for us I shutter with awe. I believe the most genuine and authentic replication of this event is “The Passion of the Christ” by Mel Gibson…it makes me fall to the floor in tears and adoration of our beloved Savior. How can you not love Jesus for all He has done for us? Several years ago my husband preached a message in one of the weeks leading up to Easter that included these details about the horrible crucifixion process. The entire church was in tears. I had to call upon the strength of the Holy Spirit to sing a duet with my good friend after the message. You did a great job presenting this Jack. We should all meditate upon this every now and again so that we never, ever take our salvation for granted. Thanks for helping me to pause (Selah) for this historical lesson brother. Thank you Pam. It’s like the old song, “When I survey the wonders of the Cross” it just floors me…quite literally. I appreciate it. The more I researched this, the more I was just amazed at how much God’s love was measured at Calvary. What a heart wrenching description. One could never fully understand what our precious Jesus suffered for the likes of us. Thank you Jesus! Great article once again, Jack. When I think of the pain He endured. I mean, I am in pain when I get a paper cut (that is not a joke, that tiny cut produces so much pain) or a splinter or a hangnail. How many times multiplied did He endure the pain of crucifixion. I can’t imagine. God bless you, Jack. Thank you Robert. I bought the DVD The Passion of the Christ and this movie shows so much of what really happened and that with every view, I can not contain the tears that flow. The greatest love ever displayed in all the universe for all time was shown at Calvary. I know what you mean about The Passion of Christ. I was not prepared for what I was about to see. It is so powerful. It is probably closer to what it was really like than any other portrayal I’ve ever seen. Very powerful and moving. No matter what one’s opinion of Mel Gibson, the movie is awe-inspiring. I Thank GOD for you my Brother Jack you Bring Glory to GOD, for this article I Learn a lot. how can I understand the Value of Christ has DONE,,, Sheding His blood on the Cross. He SUFFER GREAT PAIN just to SAVE us… WE ADORE YOU JESUS!!! Why do you say “not biblical”? You didn’t explain anything. Curious as to why you think this view is “not biblical”. God bless you. Hello Repbast1984. Thank you for your comment. Can you tell me what is wrong with Jesus covering our sins which we clearly commit 2,000 years later? How many of yours and how many of my sins were still ahead of us at Calvary? The answer: ALL of them. Well written Bro. Jack. The pain our Lord suffered was EXCRUCIATING`, and this English word, in my opinion, should not be used to express any time of bodily pain, by anyone casually. Pain of crucifixion is no ordinary pain, and has no comparison. Our Lord`s pain was compounded by the weight of the sins of the whole world, together with human sicknesses and curses. May His name alone be glorified. A verb (verbs are action oriented and this verb is used with an object[my own 2 cents, the “cross” was the object]), ex·cru·ci·at·ed, ex·cru·ci·at·ing. 2. to cause mental anguish to; irritate greatly. 1560–70; < Latin excruciātus, past participle of excruciāre to torment, torture, equivalent to ex- ex-1 + cruciāre to torment, crucify (derivative of crux cross). So amazingly the root of this word is of the "cross." Wow. His sacrifice can not be measured with words and His suffering can not be fathomed by finite human minds. I’ll right away clutch your rss feed as I can not in finding your email subscription link or newsletter service. Do you have any? Kindly allow me recognize in order that I could subscribe. Thanks. I realize this article was posted years ago but I have learned more recently what the pass-over sacrifice was and has come to mean. I am sure you well know of it’s significance but I feel it is profound and adds specific significance and gravity to these events in scope and scale. It is my understanding that thousands of lambs (korban) were being sacrificed at the same hour as Christ Jesus our Redeemer Messiah surrendered His Spirit to G-d. This was done at this hour as it was done in Eygypt on the eve of the release as slave captives under the pharo who was thought to be a god, now humiliated, to the people of that land. Well said sir. We are all eternally in His debt. I struggle this entire interpretation of Jesus’s death, and I question it not as an expert but as one who seeks to learn and would like guidance. This entire view seems to assume that (1) the Creator of the Universe, the same God who lacks for nothing, could be offended by human behavior, (2) God is so offended, in fact, that He requires sacrifice of a human being as if that sacrifice cancels an infinite number of sins and offenses, (3) this sacrifice would be a brutal, horrific, and public execution of a peaceful and great man betrayed by one of closest friends. I have yet to find a logical explanation that addresses my concerns apart from being directed to a verse in the Gospels, Letters of Paul, etc. Hello M. This is why the Bible says Jesus is a stumbling block of offense. God’s ways are not our ways and His ways are past finding out. Rather than question God in this why not just praise God that we can be saved from the wrath of God. Imagine a court judge and a criminal and the criminal comes in and the judge says, “It’s okay…I forgive you” but the family affected would cry out for justices. Whatever our view and how inferior it is to explain this all, the main things are the plain things (John 3:16), so we ought to thank God for that, right? Will you let your not being satisfied with the logic of this cause you to not accept it? Still why jesus should take penalty of the sins ? Why The Lord Father cant handle it other than killing ( i will not say crucifying, since it is wrong usage) ? Why this kind of “line of action” to be performed?